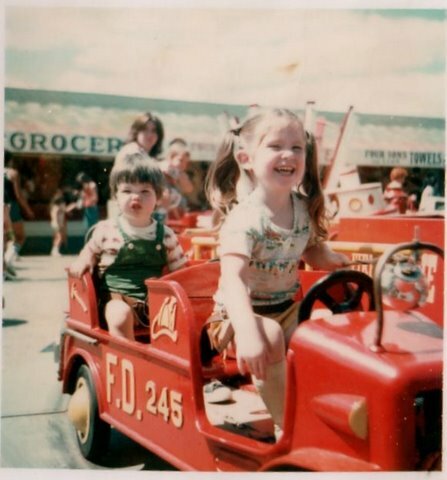 This is my brother Tommy and me on the fire truck kiddie ride at Keansburg Amusement Park circa 1979(ish). Check out our groovy duds! I wanted to replicate this photo with Colin & Anna, but the fire engines have now been replaced by a train (which you’ll see in the video I took below). We had pizza and ice cream (don’t judge–it’s dairy! ), and I bought some watermelon slices to ease my conscience about what we were eating. But on a day like this, sometimes you have to let go of all the, “This is what I SHOULD be doing” thoughts and just say to yourself, “What the hell, this is what I WANT to be doing!” When you let yourself chill, others around you can relax more easily, and you leave the day WIDE OPEN for lots of crankiness crushers. Check out my wee ones chugging around on the choo choo. (Colin is wearing a green shirt and Anna is sitting behind him.) Ignore my brief commentary about it being the same train my brother and I used to ride. I didn’t realize that it was a fire truck until I came home and dug out the old photo!